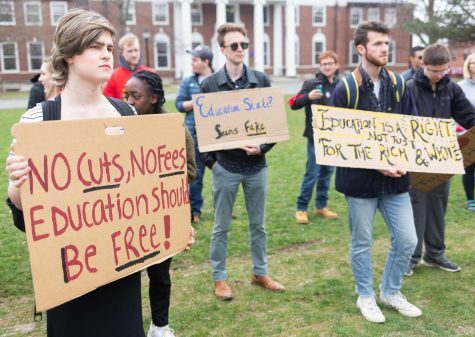 Several student organizations at the University of Massachusetts came together to march from Goodell Lawn to the Whitmore Administration Building in support of three pieces of legislation that would tackle the student debt crisis. 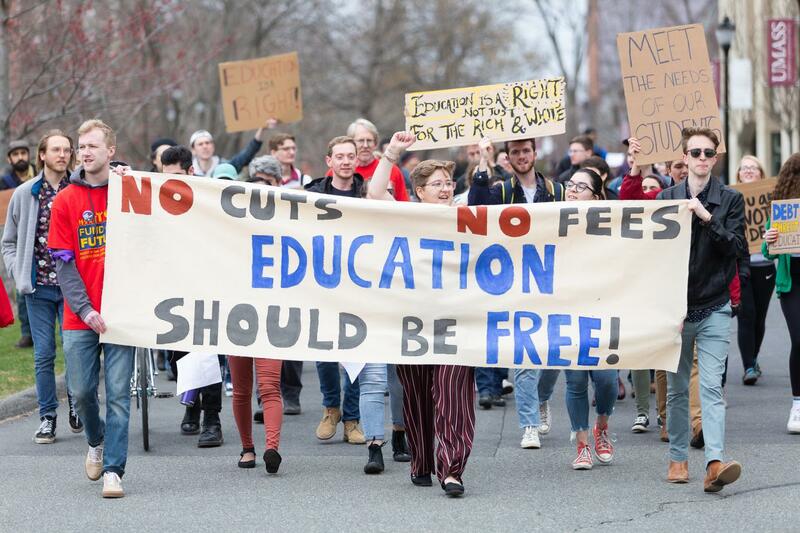 The march is part of a week of action by the Public Higher Education Network Of Massachusetts (PHENOM), which is aimed toward their Fund our Future campaign to support the Promise Act and Cherish Act. The Promise Act aims to provide $1 billion of foundation funding toward pre-K to 12th grade public schools, namely those in low-income areas. “It’s made up of formula that takes into account health insurance for teachers, educating low-income students, educating students with disabilities and educating ESL students,” said Sydney Little, the organizing director of PHENOM. The Cherish Act would raise over $500 million toward public higher education and put in a five-year tuition fee freeze for all campuses. The march also advocated for the Debt Free Future Act, which would create an agreement in the State House to pay for the tuition and fees for anyone who is a resident in Massachusetts and received a high school diploma or equivalent in Massachusetts and has been accepted to a two-year, four-year or vocational program in the state. While congregating on the lawn, several students gave speeches on the behalf of their organizations. One of the first to speak was student trustee Jiya Nair. Nair said that student debt is a personal issue for her. While attending UMass as a full-time student, Nair has also had to work all four years of college to ensure that she can continue her education, even to the point where she was working 40 hours a week. “Having experienced that and also having friends going through the same things, and having friends not being able to go back to school in the fall because they can’t afford to make up for the tuition raise has been really heartbreaking to witness,” she said. “I feel clear communication like organizing situations like this is what’s important because if we don’t engage in student voice and there is no space for it then there is no interaction, communication starts with a back and forth and right now that’s not happening,” Nair continued. 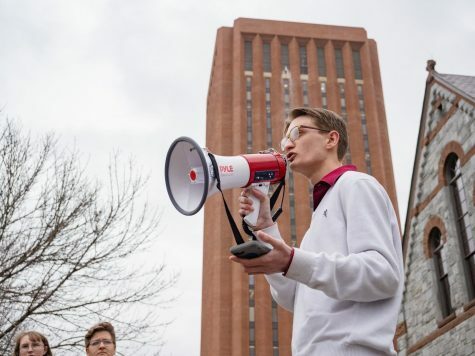 Tim Scalona, co-chair of the Social Justice and Education Committee, also delivered a speech where he spoke about his personal experience of being “lost” while battling the rising cost of attendance at UMass. Scalona, who is one of six siblings and who has experienced homelessness, said that he initially believed that going to college would be the end to him living in hotels and dealing with homelessness. However, that changed once he came to UMass. “On the contrary, what I’ve come to realize is – the game is the same, the rules have only changed. It’s different challenges in a new environment and it’s pretty disgusting. How can I and how can we as students pursue our passions and interests when we are plagued by the threat of student debt?” he asked. Additionally, Scalona expressed his frustration to find a community in a space where administrators don’t understand the need for socially disadvantaged groups on campus. It’s these issues which Scalona states drives him to fight for a change on campus. He also said that the “fight for change” can be taxing on students who the University is not “made” for, such as students of color, women and first generation students, he explained. He then spoke about college affordability and access, mentioning a 2014 New York Times article which found that 46 percent of students at UMass come from the top 20 percent of family incomes. In order to make sure that students come from various demographics, Scalona believes in supporting legislation such as the Debt Free Future Act as well as student groups like CEPA. After the speeches, the group began marching toward Whitmore, where Timmy Sullivan, the Student Government Association president, gave a speech on the importance of free education. According to Sullivan, the “austerity politics” of Massachusetts politicians and the administrations will cause tuition increases for future generations. After Sullivan’s speech, attendees of the march were encouraged to call their legislators using pieces of paper with QR codes handed out by organizers of the event. Once the QR code is scanned, attendees were able to get in touch their local legislator to advocate for affordable college. It wasn’t long until members of the crowd began exclaiming about how many legislators they had called. “I just called three legislators,” one student exclaimed, which was then met with applause. Editor’s note: Tim Scalona is a Collegian columnist. Alvin Buyinza can be reached at [email protected] and followed on Twitter at @abuyinza_news. Yeah!! Let’s protest! and hold signs!! That will show them and reduce the cost of college! 3. Reduce staff,, reduce salary of staff. 4. Cut police force in half, reduce salary. 7. Reduce umass president’s salary from 600k to 150k, in line with governor. 8. Fire the chancellor. He has been here too long and just drives around on a golf cart all day. 9. increase the salary and staff of Daily Collegian to make an uber propaganda machine pushing out umass marketing so more people go here. Why should I pay for your education? If education is a right, then someone else is obligated to give it to you. That giving is not free; indeed, it must be compelled by force through taxation. Forcing taxpayers to cough it up for your benefit is the forced appropriation of one person’s labor for your benefit. Congrats, Democrats (and other “progressives”)… you’ve returned full circle to your slaver roots. And get rid of the diversity officers. Doubtless alone all that cr*p costs millions.